Looking at the Monthly chart of the Index, we can conclude that most Volatility is still to come. The Market by nature advances with the trend and then pulls back against the trend. The Elliott Wave Theory always suggests one of the 3 advances will be extended. Most of the times the wave (III) is the stronger. The Index has created a strong move since lows at 2009. 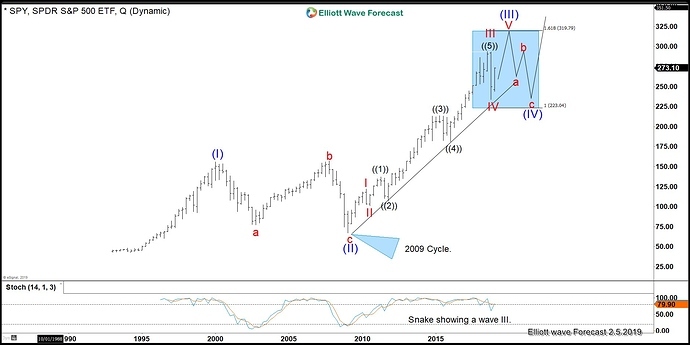 It is hard to believe another strong rally will come due to the extension since 2009.The Index Monthly chart show a advance since 2009 which can have an Elliott wave nest at the early stage. We are showing that in the following chart. We have identified 2 possible paths, and both have similar characteristics. Path 1: The Index is still within the powerful wave (III) blue. Even though the chart shows wave IV completed and a new high by holding above December 2018 low but nothing has yet confirmed that wave IV is in place so a double correction lower which breaks below December 2018 low could still happen to complete red wave IV or a sideways consolidation in the form of a triangle in wave IV red. Within this path the minimum upside target will be the inverse 123.6% extension of wave IV and that could be worked out once we have got confirmation that red wave IV has completed. In case red wave IV is already over, then inverse 123.6% extension would be in 307.6 area. This path is supported by the idea that $SPY (I)-(II) extension has not yet been reached. The 1.618 % extension is at 315.00. Most of the time wave (III) will end near there. Another reason that support this path is the idea that the Stochastic is snaking at the monthly chart which most of the time represent a wave (III) in progress due to the powerful momentum. Furthermore, the cycle from 2009 is holding the channel. The following chart is showing the Quarterly chart with the snake in stochastic indicator. Path 2: The $SPY Index ended the cycle from 2009. Thus we will be doing a series of 3-7-11 swings lower. We would already be within the wave (IV) Blue. This path will make the Index holding last year peak and turning lower by 2.13.19-2.18.19 or 2.25.19 to 3.5.19. We should see another leg lower before a turn back higher. This path is supported by the idea that stocks like $APPL and $FB have ended their all-time cycle up. This is very similar to the 2009 cycle. Placing both paths together and seeing the strong advance since 2009, we believe a wave III in some degree have already ended and a series of nests either within the 2009 cycle or a big wave (IV) will take place. 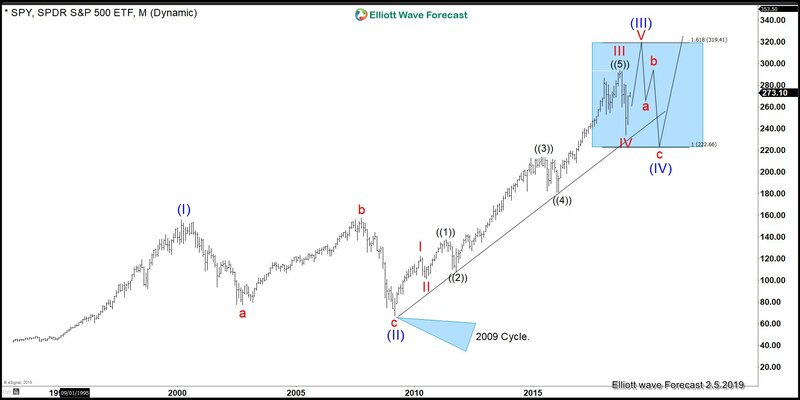 We are ready and with the help of the Elliott wave Theory to understand that a lot of volatility can happen in 2019 and buying the dips is The Right Side. This is one of the better posts on BP as of late. I wish more people traded the indices and followed this type of analysis.